The Book of Divine Magic provides many new ways to define your divine spell-casters. Twenty-one new deities - good, evil, and neutral - are introduced, complete with dogmas, portfolios and domains. Along with the new domains, you'll find over 100 new spells, from minor orisons to fate-changing 9th-level spells. Several major houses of worship are detailed, to act as important places in a character's past, a destination for their future, or even a home base. For years, druids and rangers have had their animal companions, and paladins their warhorses - now clerics can have divine animal companions too! Dozens of new magic items are revealed, from handy adventuring aids to the holiest of relics. 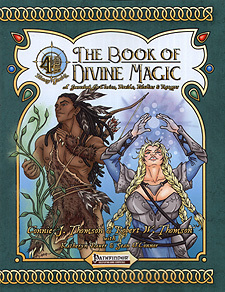 Both players and Game Masters will find The Book of Divine Magic an indispensable tool for creating unique characters and exciting plotlines.